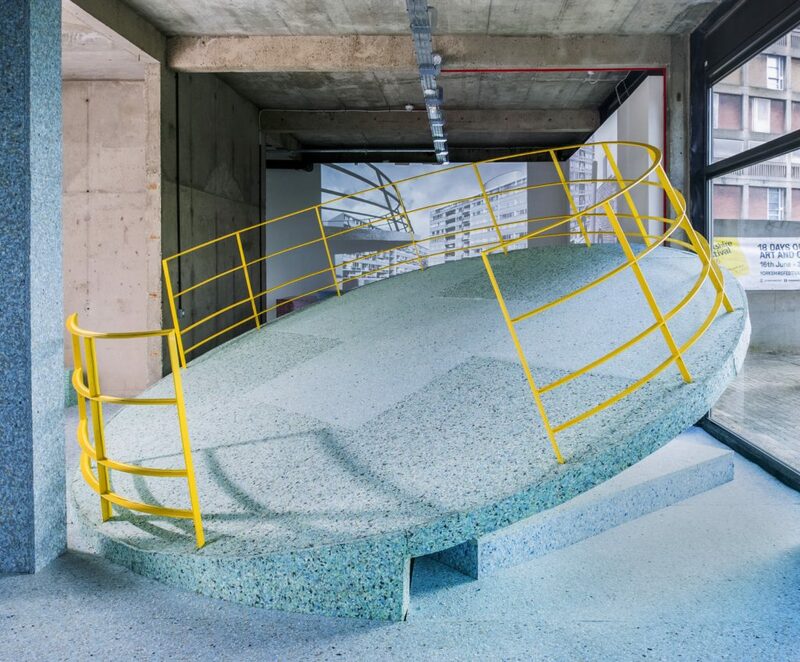 Assemble and Simon Terrill, The Brutalist Playground. Images courtesy of the artists and S1 Artspace. Photography by Alun Bull. It was the first time that I have been up to the infamous Park Hill estate and I was taken aback by its sheer enormity and looming presence. Having written about the history of the estate in a previous review, and of course being able to see it from almost anywhere in the city centre I knew it was a massive structure, however I did not imagine feeling quite so dwarfed by it. As Europe’s largest listed building, it has become an icon for post-war reconstruction and is in the process of being transformed into modern apartments, commercial space and social housing – re-imagining the community ideals of original architects Jack Lynn and Ivor Smith’s ‘streets in the sky’. This kind of tower block style structure exists on the periphery of every large town and city across the UK, but the significance of this estate and its current re-development project creates a perfect context to house The Brutalist Playground a work created by Assemble and Australian artist Simon Terrell. 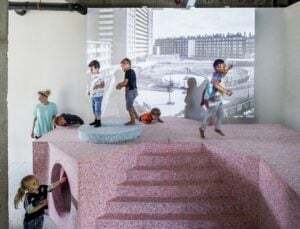 When we arrived at S1 Artspace at Park Hill (in what was once The Scottish Queen pub) we overheard two young children being asked to remove their shoes and so we gleefully followed suit. A series of metal coat hooks positioned about 4ft off the floor immediately evoked that feeling of getting ready for P.E when you knew that it was your class’s turn on the trampolines. Stepping out from the hard floor to the soft sponge-like tiles, the feeling of play instantly permeates through your heels. 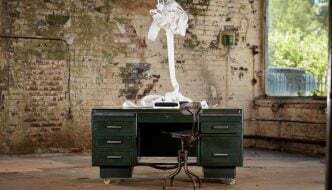 Now while my own practice utilises the idea of play to break-down the stand-offishness associated with ‘high-art’, I do still have an ingrained pre-conception of how you are supposed to ‘behave’ in an exhibition. My partner however, having not been through Art School or to many exhibitions, immediately starting bouncing around and interacting with the space in much the same way as the children running around us. This, for me, is exactly what this kind of art is trying to achieve – it bridges the gap between contemporary art and community interaction, asks you to take off your shoes, get involved and be more than just a passive viewer. Whether you do is up to you – but I would definitely recommend it, get down on your hands and knees, roll around, build something and have some fun. 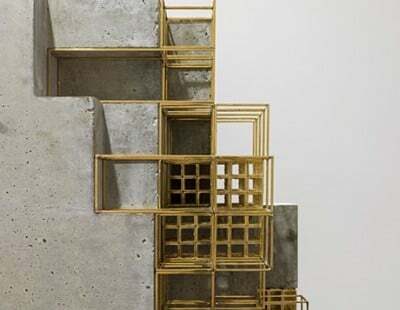 I have to admit to having a bit of a groupie-style crush on ‘art’s’ collective Assemble, having familiarised myself with their work when they were nominated for The Turner Prize last year I was surprised and inspired when they became the first architecture/design collective to win. Their projects are ambitious and their collaborative model that seeks to activate the public as an audience and a collaborator is something to be admired – I truly believe ‘art should do more’ and these guys really are. Collectives like this have been springing up all over Europe in the last decade, many of them with a similar ethos of inclusivity, but it’s the recognition of Assemble winning The Turner Prize that really emphasises progression in the arts. It’s so important in a period of low-economic support for the arts, that artist’s’ working to involve communities get the affirmation they deserve. 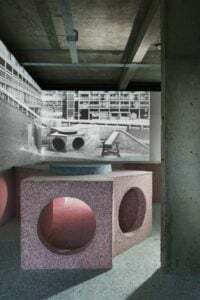 This particular project that Simon Terrell and Assemble have re-designed for the Park Hill estate creates a conversation about an overlooked element of social housing. 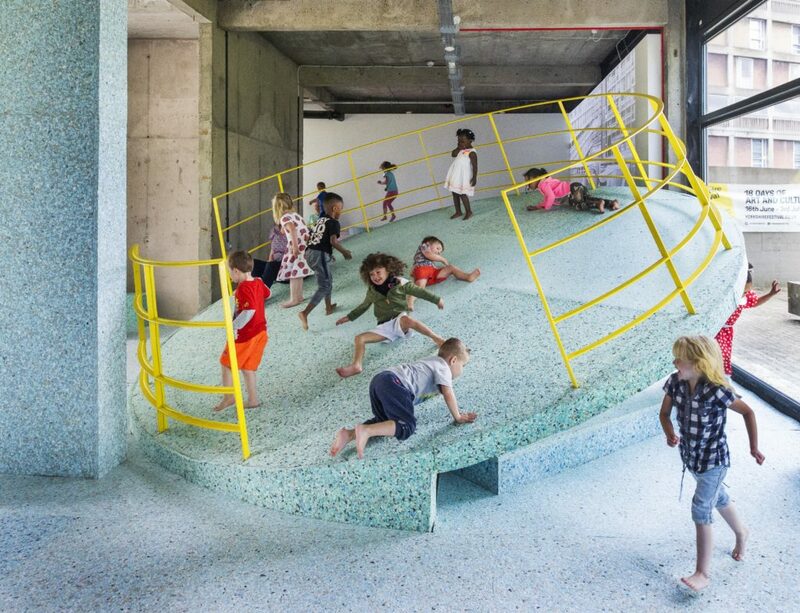 Through the use of archival material on children’s playgrounds that have been designed in this style and an immersive space, participants are invited to experience what it may have been like to interact with them. During our time at the exhibition, we watched several families climbing and building, small children enjoying the space for it’s sheer wonder – unknowingly absorbing history and culture through the action of play. Arguably of course, children could get the same enjoyment in any park or play-pit, yet what I really saw was that this kind of cohesion of arts and entertainment gives way to a new, alternative education which has the ability to empower children (and adults!). 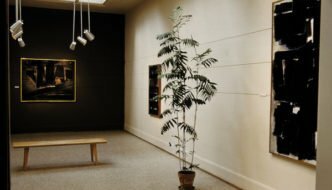 Plants in your exhibition: Is it time for a prune?